Cold calls are the ugly Christmas sweaters of the sales world: no one likes to receive them and only rare, uniquely talented individuals seem to enjoy making them. 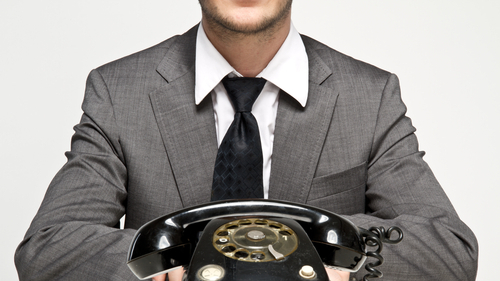 Why are cold calls so often maligned and unappreciated? The biggest reason is that a cold call is almost always an interruption or unwanted surprise, and prospects have honed their defense mechanisms to be resistant to these unsolicited sales pitches that arise when least expected. Like any business people, prospects have many things on their minds and this creates a challenge when trying to conduct a round of appointment setting cold calls, because any cold call – no matter how potentially valuable it could be to your prospect’s business – is often seen as interrupting them from more urgent or seemingly important matters. Making matters worse, if the prospect doesn’t know you and doesn’t know what you’re selling, they are often suspicious of your motives and are immediately bracing themselves for a “hard sell” sales pitch. This innate resistance can make it hard to even get through the first level of appointment setting. As a sales person, how can you take the chill off of your next round of appointment setting cold calls? Make it about appointment setting, not sales: Just like a tennis player doesn’t need to win every point on the first shot, the first conversation with a prospect should not be expected to close the deal. Instead, focus on the immediate goal of appointment setting. If you can use the cold call as a way to build enough trust to conduct appointment setting and get in front of the prospect, the rest of the sales process can proceed from there. Strike a balance: The sales person needs to perform a delicate dance between selling and not selling, between keeping it light and being direct, between building trust and rapport, and not wasting your prospect’s time. Appointment setting is all about creating enough of an interest in the prospect that they’re willing to meet with you to hear what you have to say and see more details. You don’t have to sell them on every last feature of your product (and aggressive, “hard-sell” sales tactics are likely to backfire more often than not, especially for sophisticated buyers). Set expectations and empathize: Instead of pressing for an immediate sales decision, talk about the sales process. Empathize with the prospect, explain that you know they need time to make a decision and you can send literature or present a detailed proposal that is customized for their needs. Ask for them to commit to appointment setting as an initial step, with no pressure and no obligation beyond that point. Make the conversation about being of service to the prospect and delivering value to the prospect’s organization, not just notching up another sale toward your quota. Keep your promises: The first thing to do on a successful cold call is to capture the prospect’s attention and set the scope of the conversation. Explain that you have something to share with the prospect that you think will be valuable to their business, and emphasize that the purpose of your call is appointment setting to continue the conversation further. In a sense, your opening line needs to create a promise that you’ll fulfill throughout the rest of your discussions. Ask questions: As part of the process of that initial cold call, it’s important to ask qualification questions to make sure that the correct sales literature and product information gets sent to the prospect. Asking questions is also a way of making the call is about the prospect and his/her needs (instead of making it a self-centered “hard-sell” sales call that is all about the sales person’s needs.) Just the simple act of asking questions can be highly effective in disarming the prospect and making appointment setting more likely.